Hand-drawn with micron pens, digitally painted in Photoshop. Created for the Calgary Comic and Entertainment Expo Artbook 2018: Adventures in Time, in support of the Children’s Wish Foundation. Hand-drawn with micron pens, digitally painted. Created for the Calgary Comic and Entertainment Expo Artbook 2017: Fairy Tales and Classic Monsters, in support of the Children’s Wish Foundation. Hand coloured in Prismacolor pencil crayon on a printed copy of ABC Monstrosity, with a digitally coloured background. 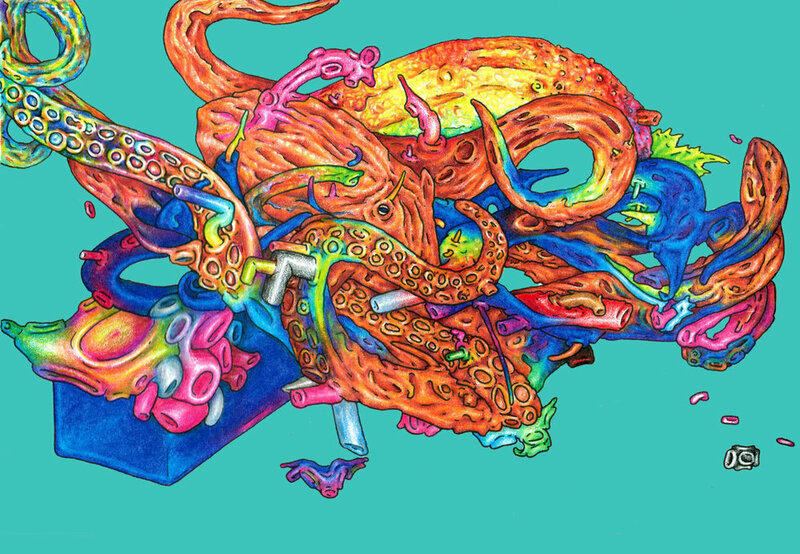 Coloured by hand with pencil crayon, on a printed copy of ABC Monstrosity, an ABC book where all the illustrations combine to form jewel-toned monstrosities. Hand coloured with pencil crayons on a printed copy of ABC Monstrosity, digital background. Hand coloured with pencil crayon, digital background. From ABC Monstrosity, the upcoming full colour children’s book.